Milwaukee Motorcycle Clothing Company men’s leather gauntlet riding gloves are fully lined and feature a velcro wrist closure for a secure fit. Unlike most reviewers, I’m a daily commuter on my motorcycle. It’s my ONLY method of transportation-meaning I ride in sun, rain, hail, sleet…and occasionally, snow. (I live in north Texas, so it isn’t too bad, but the weather can surprise you.) So it was important for me to find a good quality pair of gloves. I’ve had plenty of gloves of varying degrees of utility, but I’ve never bought any online until now. What I like about these gloves is that they effectively block the wind. More than anything else, the wind is what will make you feel like you don’t have fingers anymore-from those short to extended trips (15 miles and up). Further, the gloves allow a reasonable amount of dexterity. Most times, I have to take a glove off to fish something (keys, gum, cell, etc.) out of a pocket at a rest stop or other pause for the cause. Not to mention having a difficult time working the clutch and brake levers on Baby (don’t judge). But these gloves don’t make me feel as though I have two meat cleavers for hands. That’s a big plus. The leather is of a good quality, almost matching my jacket perfectly. The inner lining is soft and keeps your hands warm. The Velcro tightening strap at the wrist is more or less useful-I don’t need them, but I can see how someone else may use them for added security to make sure they stay in place on your hands (I guess?). So, yeah-on all but two points, a nice bang for your bucks. Point one: the gauntlets. While they are lengthy-which should be good-they have a sort of “flare” design to them that I believe was intended to accommodate jacket/duster/coat cuffs of differing makes and thickness, which sounds great, but it doesn’t work well in practice. The flare is too wide, and there is no lining, so the material has no weight. When I’m on the interstate pacing at 75-85 mph, the wind whips these flimsy gauntlets so easily they end up TURNING INSIDE OUT (i.e. folding up over my hands) inexplicably. It’s pretty hilarious, actually, but frustrating when you’re trying to keep that 50 degree wind chill from creeping up your sleeves. Still, a minor qualm so long as I can feel my fingers. Just tuck them into your sleeves, maybe? I just deal with it. Lol. Point two: the sizing of the gloves. Be warned: these gloves run small. SMALL. I read an extensive number of reviews before ordering, so I was able to avoid having to send them back-but only because I had the foresight to order two sizes larger than what I typically wear. (I have long, slender fingers…only perhaps a tad bit above average sized hands.) I usually wear a Large in most gloves. I ordered an XXL in these, and they fit perfectly. So, if you’re going to order these, please keep that in mind. All in all, a good pair of gloves. Especially considering the price. 4 out of 5 stars because of the weird gauntlet thing and questionable sizing. They arrived in two days, so I was pleased with that as well. Good job Milwaukee Motorcycle Clothing! 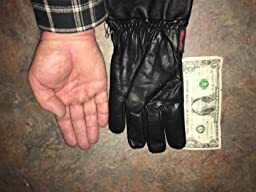 (It’d be great if you included a sizing chart for your gloves in the description, though.) A good buy! BUY BIG! Seriously! I have an XL hand and I ordered the XXXL gloves. They are a tight fit. They quality is pretty good for the price and I can wear them and get my phone out of my jeans pocket, keys too. Very comfy. BUY BIG though! Holy crap! They really got the size charts wrong! The photo shows the XXXL, the biggest size, Use the dollar bill as a reference. Using them second winter season in Oregon (I have different gloves for summer)! Love the quality and design. Insulation is good, but getting cold at less than 35F. I am commuting for about 10 minutes, and I am getting really cold if it’s 35F outside. I know many of you wouldn’t ride if it’s that cold, just heads up! Oh, yeah, waterproof!